If you plan on having your wedding in the summer months, there are many exquisite wedding dresses that you can choose. Many brides want strapless gowns because they have a feminine look and can be cool in the hot weather. If you don’t want to go strapless, you can consider many other types of bridal gowns. If you want to stay both fresh in the heat and modest in your dress, look for ones that have lace shoulders that extend to your upper arms. The sleeves of many summer wedding dresses have patterns of flowers, leaves, and butterflies. You can match the lace pattern of your sleeves to your veil, sash, or train. Another type of dress in the simple wedding dresses category are bell sleeved gowns. They add a hint of romance to a summer wedding ceremony. This dress will especially appeal to brides with Renaissance or bohemian styles. If you’re looking for these gowns in a bridal boutique, seek out items with lace or sheer sleeves. These gowns are the most suitable for summer weddings because they’re less constricting. Some brides prefer dresses that are more on the provocative side. A dramatic back is popular in the summer months because they are not elegant, but they help the bride keep fresh on a potentially hot day. Consider dresses with a corset-like back that ties with satin laces. You can also look at gowns with a plunging back. Lace backs and scoop backs are other options that you can decide upon when you go dress shopping. 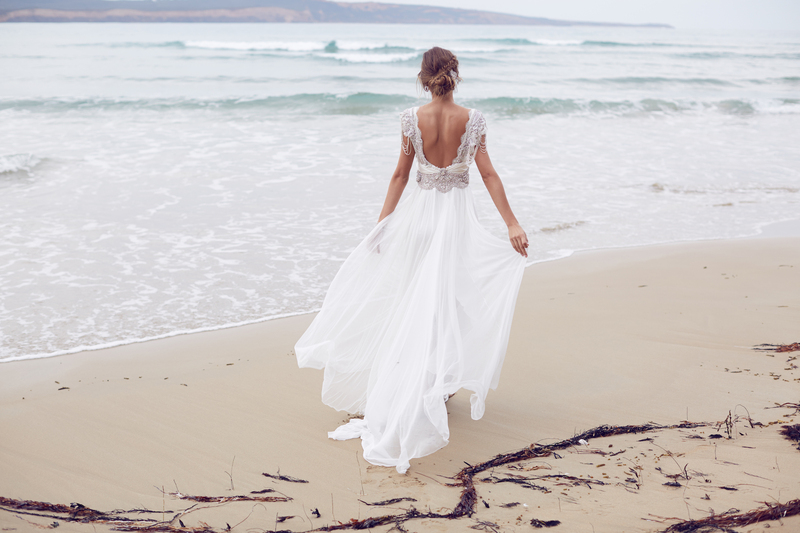 Those brides who want a beach ceremony should look for simple beach wedding dresses that mesh with the scenery. Mermaid skirts fit this purpose as they bring to mind the waves of the water as well as accentuates the curves of the bride. Which Dress Will You Choose? Whether you decide to go for the simple look or want to go the designer route, you can choose from many different styles that will suit a summer wedding. From bell sleeves to plunging backs, you have quite a few possibilities when it comes to selecting a dress for that special day.